If you need proof that the SsangYong Korando is aimed at caravanners, consider this – every dealer demonstrator is fitted with a tow ball. Try walking into a rival showroom and asking to tow your caravan on a test drive; not only are you unlikely to find a car with a towball to test, you won’t find a comparable crossover like the Hyundai ix35, Kia Sportage or Nissan Qashqai at a similar price, either. The SsangYong range starts from £14,995. That buys the two-wheel drive S model, but the sweet spot in the line-up is the £18,795 SX, which has four-wheel drive, plenty of equipment, and undercuts any comparable rival. Air conditioning, alloy wheels, rear parking sensors and a six-speaker stereo are standard, along with six airbags and stability control. Value for money is the Korando SX’s most obvious strength, but it’s far from the only one. Take a look at the spec sheet and you’ll see the Korando shows promise as a tow car. The kerbweight of 1747kg makes for a healthy 85% match figure (as usually recommended for safe and stable towing) of 1485kg. The legal towing limit is a healthy 2000kg, considerably higher than most rivals’. Out on the road, though, you do notice one or two rough edges. 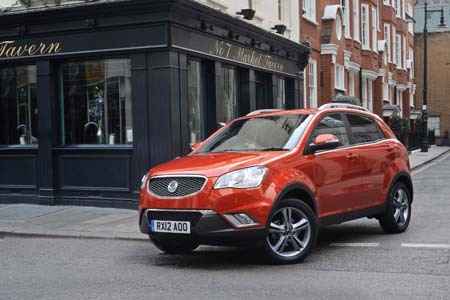 The steering is vague and although the 2.0-litre diesel’s refinement is much improved since the Korando first went on sale, it’s not the quietest of engines. Fuel economy is also a little off the class best, with an official combined figure of 45.6mpg. The Hyundai ix35 2.0 CRDi 4×4 betters that with 49.6mpg on the combined cycle, although the 134bhp engine in the Hyundai is nothing like as powerful as the SsangYong’s. Over bumpy roads the Korando’s ride is comfortable but it doesn’t handle with precision of a Ford Kuga or Mazda CX-5. That said, the Korando is a stable tow car at motorway speeds and the engine makes up for slightly gruff manners with plenty of mid-range pulling power. It’s more than strong enough to haul any suitably matched caravan, easily holding speed on hills and with enough poke for confident overtaking. If you’re looking for an even smoother journey, make sure to download a pre-towing checklist sticker. You won’t need to travel light, either, as there’s plenty of luggage space in the 486-litre boot. The cabin is roomy, too, with more head and legroom than in the Hyundai, Kia or Nissan. The extra space is especially noticeable for those travelling in the back, where there’s no transmission tunnel to get in the way of anyone’s feet when there are three rear-seat passengers. Just don’t expect any soft-touch plastics in an interior which looks rather plain compared with the Giugiaro-designed exterior. And while most controls are easy to use, you need toothpicks for fingers to operate the stereo. The optional touch-screen sat-nav (£999) is less fiddly. But while it’s possible to find fault with the Korando, its flaws are minor when you consider its price, performance and comprehensive five-year unlimited mileage warranty. There’s nothing else quite like it for the money. 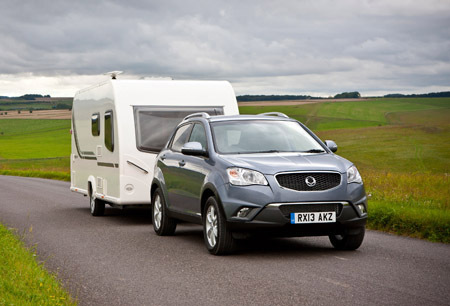 Read more about the SsangYong Korando’s ‘towing talent’ or check out our caravan pre-towing guide for handy tips and advice. The Korando does everything we ask of it, the ride is fine, the engine is slightly noisy but nothing too bad, yes the plastics are maybe not the quality of other cars but everything works and you don’t touch the dashboard all the time. The car had auto air con, heated seats, Bluetooth etc, so has enough toys to keep me happy. I just bought a Korando EX all wheel drive, 56k and 62 reg for £6500, a £23k car initially. It is superb, great spec and with 5 occupants trailing a folder camper loaded up to gunnels it is a dream to drive. I wouldn’t hesitate buying an ex demo or another one in years to come. Even had friends comment “where’d you get the money for that until they see the badge” great looking car. I have a Korando SE 2.0 Automatic Diesel, I don’t own a caravan, but I have to admit I was impressed with the vehicle’s towing capability and flood handling. It pulled a 1 tonne horse box with a 550 kg horse and a 400kg horse, so really pushing the pulling power close to it’s limit of 2 tonne and we encountered deep flood water (over 12 ” deep). But my Korando handled everything brilliantly. I wouldn’t hesitate recommending the Korando, because if it can pull my horse box and 2 horses, then a decent size caravan will be a doddle. I have just viewed a new Korando ELX auto to replace my 2008 Honda CRV (original owner). I want an auto and Honda are too expensive at my time of life. I was staggered by the cost/value of the Korando. Could someone please confirm a “real” towing mpg and solo mpg for the auto box. Many thanks. I have owned a Korrando ELX for over two years now it is the automatic version and find it to be fantastic. It tows a 1600kg caravan with ease and doesn’t slow down when going up hills. I wouldn’t hesitate recommending the car, I am really impressed. As you can see there are a few people here that might be able to give you a better idea on how economical the SsangYong Korando is. Can anyone give Steve any more details? Purchased an Korando SE 2wd 2014 model ex demo with 2300 miles on the clock pulling Lunar Quasar 554 max 1355kgs so far so good have pulled upto Berwick upon Tweed and then on to St Andrews in Scotland plus some more local trips up into North Yorks. Plenty of power when required & cruises very well. I seem to be getting around 32mpg towing & in excess of 40mpg commuting to work and back but did get 50mpg on M62 without the caravan down to Junction 32 & back. So far very impressed with the car don’t find it that noisy as reports seem to indicate. Plenty of space for all the junk one seems to carry and 2 small dogs. I can recomend this car as a good tow car (CC tow car of the year in its class) and for the price there is nothing else on the market to even come close. Thanks for getting in touch – and for the superb review! We’re always encouraging people to get in touch with feedback on our model reviews so it’s great to see you took the time to do so. Hopefully this will help those who are thinking of buying a Korando! Had the Korando for five weeks.In that time I have covered1250 miles.A 200 mile coastal trip averaged52mpg driving at 50mph due to speed cams!Recently a much longer trip to south coast towing my Bailey caravan 1300 kg averaged33mpg.Not bad for first trip.I am favourably impressed with the car so far it is roomy and comfortable with plenty of storage space and has proved to be a stable and powerful towing vehicle.Anyone interested in changing their towing car should ignore all the adverse motoring press and give the Korando a test drive!May be in for a surprise! Thanks Fraser! This is bound to help anyone who’s thinking about which tow car to go for. update on my post of July last year . We have now towed our caravan through Luxembourg and again through Holland. We now have a bigger caravan ,Adria 1500kg and our Korando tows like dream. It has now done 20000 miles without a blip.Fuel consumption is also better now that the engine is loosening up a bit.Averaging (not towing) 42mpg. Yes, keep us posted Fraser! 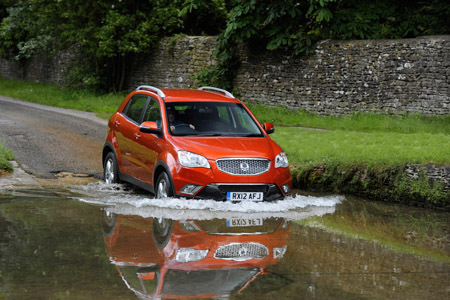 It’s great to hear that you’ve had a good experience so far with the Korando – long may it continue! 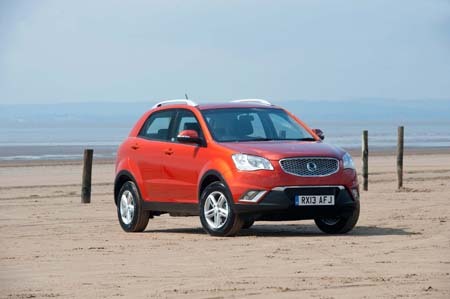 It’s great to hear such good feedback on the Korando – especially from an someone who owns one! A good article but how many have you seen on the road? What are the three year residuals like? I own a Rexton which would pull a house, however after 5 years it is worth next to nothing, will the same apply to the Korando? Thanks for a very interesting article, I am looking at a change and will certainly take a good look at the Korrando. I spoke with my local dealer and it appears that Ssangyong are about to introduce a campaign where you can borrow at a very limited cost a Korrando for a couple of days and try towing for yourself. That makes real sense, well done Ssangyong , shame more manufacturers don’t follow their lead.